A picturesque, remarkably clean metropolis encircled by fast-growing suburbs, Toronto is Ontario’s main Great Lakes port and industrial center as well as the commercial and financial hub of Eastern Canada. And, despite its sprawling layout and imposing downtown cityscape, it is refreshingly green. For example, High Park in the city’s west end sprawls over 400 acres (160 hectares) and is made up of trails, ponds, gardens, an outdoor swimming pool, picnic areas and even a small zoo. Eliminate stress and travel confidently to Torontoby using our Virtuoso, Canada Travel Advisors. Save time, get more value. We do everything for you: air, car, hotels, transfers, tours that include free upgrades, extraordinary airfare deals and luxury touches that will maximize your enjoyment. Get priceless Toronto vacation information. It will help us to help you, if you begin with our vacation planner so we can match you to our Canada expert that suits you best. 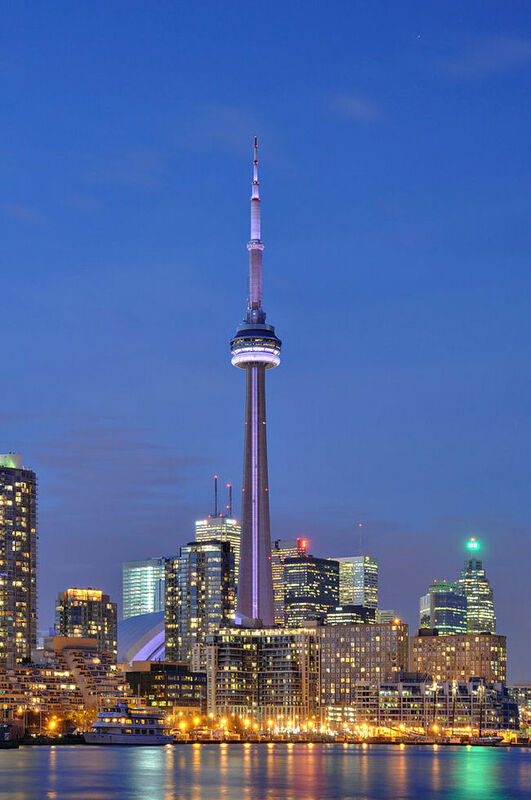 Toronto is now internationally regarded as an attractive and exciting tourist destination. The city’s relatively recent transformation is largely due to a massive influx of different cultures since World War II. Of the 3.9 million residents now in Metropolitan Toronto, more than one million have roots in non-English-speaking countries. These groups have brought with them their customs, cultures and cuisines, sharply changing and improving – the city’s character. No longer a predominantly White AngloSaxon Protestant (WASP) city, Toronto is now a cosmopolitan melting pot with dwellers speaking more than 100 different languages. The thousands of tons of rubble that resulted from excavating the subway and from other massive construction projects have generally been put to good use in Toronto. In 1971, Ontario Place, an outdoor entertainment complex with its striking geodesic dome, opened on Toronto’s western waterfront. This worldrenowned complex was built on islands reclaimed through the dumping of this rubble. It is part playground, part exposition and cultural center and mostly lush green park. Children’s Village is two acres of imaginative play areas for kids. The Cinesphere was one of the first 1MAX installations in the world, and the Forum is the scene of live entertainment. The Pavilion, a series of interconnected pods built on stilts right in Lake Ontario, houses restaurants and exhibits about Ontario. Adjacent to Ontario Place, near the lake, is the site of the world’s largest annual exhibition, which began as an agricultural fair in 1879. The Canadian National Exhibition (CNE), or “Ex” as it is fondly known by Torontonians, attracts more than two million visitors each year during its three-week summer season. There are scores of frightening rides at the midway (including bungee jumping), concerts at the Grandstand, miles of display booths, an international air show, foreign pavilions, agricultural exhibits, a casino and more. It is open from mid-August to early September. A large agricultural fair still takes place on the Exhibition grounds every November. The highlight of the Royal Winter Fair is without a doubt the equestrian events. The Marine Museum of Upper Canada, located at Exhibition Place just off Lakeshore Road West, is an excellent spot to learn all about Toronto’s extensive maritime history. It’s open daily. Also at Exhibition Place, the Hockey Hall of Fame pays homage to Canada’s favorite sport, and visitor’s can catch a glimpse of the National Hockey League’s covetted trophy, the Stanley Cup. The Canadian Sports Hall of Fame documents Canada’s sporting history and star players. Fort York played a crucial role in the War of 1812/14 with the United States and boasts the largest collection of rebuilt War of 1812 buildings in Canada – eight brick, log and stone relics brightened by the brilliant red coats of guides dressed as British soldiers. There are musket drills, music and interpretative exhibits including a 32-man barracks bristling with period military regalia. Just east of Ontario Place and the Exhibition grounds, an area known as Harbourfront spans the scenic shore of Lake Ontario from the foot of Bathurst Street in the west to York Street in the east. A transformation of 10 acres of former industrial properties along the lakefront into a recreational and cultural complex, Harbourfront is probably one of the cleanest and most attractive big-city harbors anywhere. Although the area is at its busiest during the summer, activities continue on a year-round basis with shopping, restaurants, concerts, films, art galleries, and an antique and flea market. Queen’s Quay Terminal is a dramatically renovated 1920s warehouse reopened in 1983 as a major point of interest in the heart of Harbourfront. The greentrimmed concrete-and-glass structure houses a variety of boutiques, restaurants, some with lakefront patios, and the Premiere Dance Theatre. For the highly energetic sightseer, Skate Toronto, in the west side of Queen’s Quay Terminal, rents inline skates as well as all the padding (knee, wrist and elbow) necessary, by the hour, halt-day or entire day. From Harbourfront, visitors can board a ferry for a quick trip to the Toronto Islands. Made up mostly of tranquil parkland and sandy beaches, the islands include Hanlan’s Point, Ward’s, Centre, and Algonquin Islands. Centre Island, the busiest, has 612 acres of park, picnic grounds, restaurants, boating, a barnyard zoo and Centreville, a child-sized replica of a 19th-century Ontario village with lots of rides. There are also boats and bicycles for rent. The islands offer a very pleasant escape from city heat and bustle during the summer. 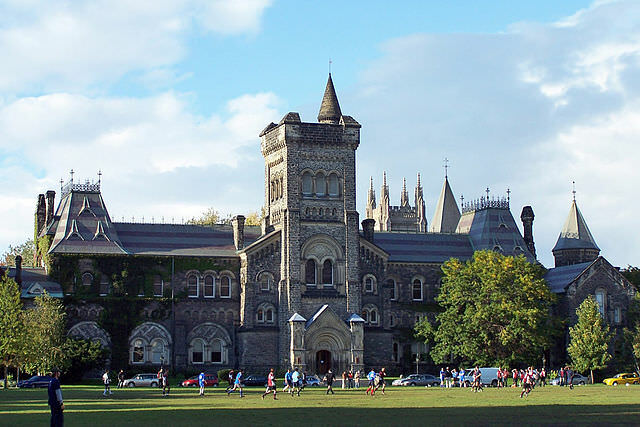 Visually, Toronto is an eclectic mixture of ethnic neighborhoods and wellpreserved historical buildings. As a city, it has gained a reputation for preserving the best of the past while looking to the future. Underneath all of these buildings lies a warren of interconnected underground shopping malls. 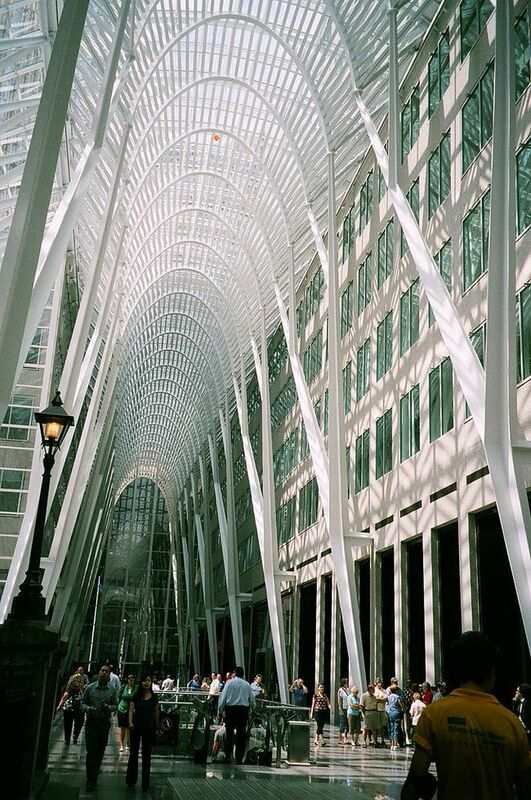 They include the Royal Bank Plaza, Commerce Court, First Canadian Place, the Toronto Dominion Centre, among others. This underground consumer heaven, Underground Toronto, stretches north from Front Street to Queen Street, and between Bay and York streets. 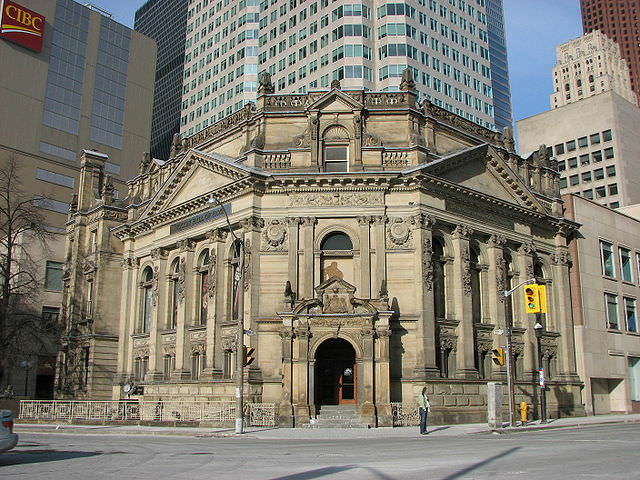 A number of important historical and cultural centers can be found just east of Yonge Street – allegedly the world’s longest street -, in a district that covers many blocks along Front Street East. Ballet and opera aficionados should check out the O’Keefe Centre for the Performing Arts by the National Ballet of Canada and the Canadian Opera Company, as well as by guest performers from all over the world. Built in 1969, it was at that time the largest concert hall of its kind in North America. 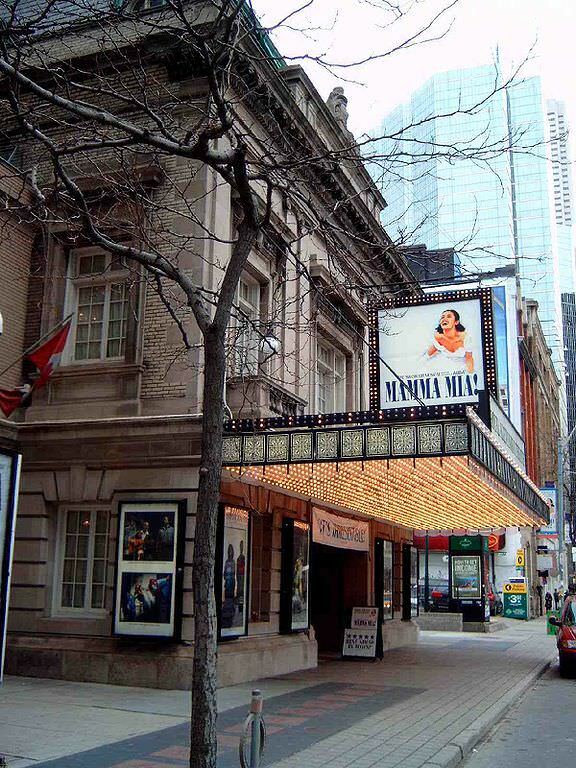 For theater buffs, there is the St. Lawrence Centre for the Arts nearby, which includes the Jane Mallett Theatre, seasonal home to Theatre Plus Toronto; and the Bluma Appel Theater, home of the Canadian Stage Company. Once Toronto’s City Hall (prior to E.J. Lennox’s version) St. Lawrence Market stands at the corner of Jarvis. It has a farmers’ market on Saturdays and an antique and collectibles market on Sundays. Heading east from downtown along the shoreline is a former cottage community known as the Beaches. While it is now absorbed into the city, it maintains its small-town atmosphere. In the heat of the summer, a stretch of parkland and beach along the lake with a well-used boardwalk are popular among bicyclists, pedestrians and sun-seekers. In recent years, the strip of Queen Street East which is the Beaches’ mainstreet has evolved into a trendy shopping and dining area. The Eaton Centre, a massive shopping complex that opened in 1977, is almost next door to Old City Hall on Yonge Street between Queen and Dundas streets. It has swallowed up numerous blocks, and is still growing.Hundreds of shops of every description, a multiscreen movie complex, restaurants and more are its claim to fame. It’s open during the week from 10 a.m. to 9 p.m., Saturdays, 9:30 a.m. to 6 p.m. and on Sundays from noon. One of the world’s largest and most successful shopping malls, the Center generates millions of dollars in business and attracts more than a million shoppers a week (subway station and parking garage are included in the complex). 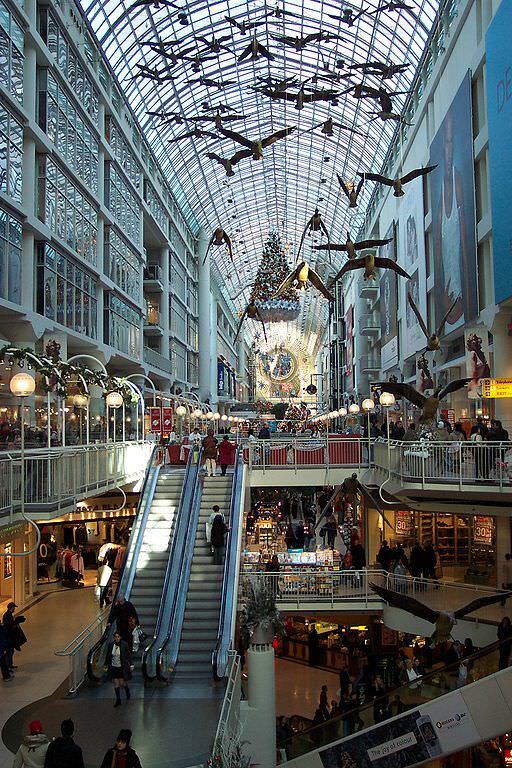 The four-level atrium has a glass roof and is furnished with fountains, trees, plants and even a flock of lifelike Canada geese (by Canadian artist/musician/film-maker Michael Snow) suspended in flight high above the heads of shoppers. Geyser-like fountains shoot up several storeys and there are park benches everywhere. Cradled by the Center are three of Toronto’s oldest landmarks – the 1847 Holy Trinity Church, Scadding House and the Old Parsonage. Preservationists insisted that the sun continue to shine on the church’s twin towers, and it does. Across from the Eaton Center on Yonge Street – reputedly the longest street in the world – is the elegant Pantages Theatre.